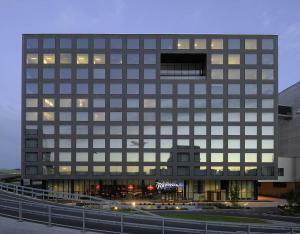 Welcome to Zurich’s largest convention hotel. Located just across the airport terminals and only 10 minutes from the city center—ideally located for both business and leisure travelers looking for the unusual. Zurich’s only hotel with direct access to the airport amazes with its location, vanguard design and not-everyday gastronomic concepts.The only hotel with access to Zurich International Airport.330 stylish guest rooms and suites in distinct designs, some with stunning airfield view.Free high-speed internet access available to all hotel guests and meeting delegates.Radisson Airport Conference Center with 52 conference- and banquet rooms on over 3,720m².Filini Restaurant serving fresh Italian classics prepared with a modern twist.Premium meat and fish specialties at the angels’ wine tower grill.PACE Fitness Club with modern workout equipment, sauna, steam bath and relaxation area.Airport Fitness & Wellness Center operated by Bad Zurzach AG in the basement floor of the hotel covering 1,600m². The Radisson Blu Airport Conference Center with its 52 meeting rooms spread over 3,720m² is Switzerland’s most comprehensive hotel conference area. The meeting facilities in various sizes are perfectly designed for both conferences and small meetings of a day or just a couple of hours duration.